Want to learn and use data science (predictive analytics) and/or management science (prescriptive analytics)? 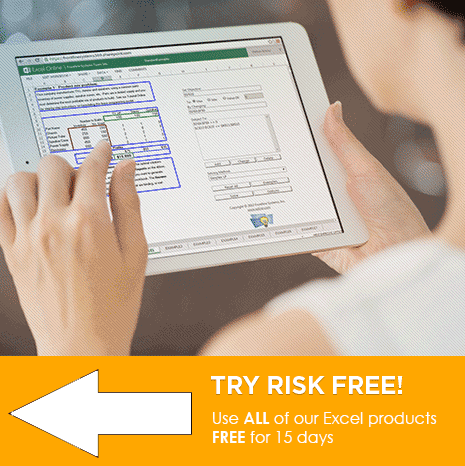 We have powerful Excel-based tools, RASON modeling language, and learning resources for you. Want to work with a developer in your company who doesn't use Excel, to turn your Excel model into a deployed application -- without rewriting it in a programming language? With RASON, we can make this radically simple. Solve large-scale linear and nonlinear models Solve models with thousands to millions of variables and constraints. Linear and quadratic, mixed-integer, smooth nonlinear, global optimization, non-smooth evolutionary, robust optimization and stochastic programming Solvers are all included. Ultra-Fast Monte Carlo Simulation Easily define uncertain variables with sampling from 50 continuous, discrete and custom distributions, copulas and rank-order correlation, and distribution and correlation fitting. Decision trees for complex decisions Build multi-stage decision trees with point-and-click ease, compute expected value and utility-based rollbacks, and incorporate decision trees in simulation and risk analysis. Time series forecasting Apply the most popular exponential smoothing and Box-Jenkins (ARIMA) methods with seasonality to forecast time series, such as sales and inventory, from historical data. Prediction and classification methods Use powerful multiple linear and logistic regression with variable selection, data mining methods like naive Bayes, CaRT, k-nearest neighbors and neural networks, and ensembles of multiple algorithms. Much, much more This is just a brief overview -- see more extensive features -- and it's all included, even in our ultra-low-cost Analytic Solver Basic! Analytic Solver models work in desktop Excel, Excel Online, Google Sheets, Power BI, our AnalyticSolver.com -- and Your Server, Web or Mobile app. across platforms Leverage your modeling investment - Excel-based and RASON-based models can be run on desktops and servers, inside popular Cloud BI tools, and in web and mobile apps. across platforms Leverage your license investment - Your Analytic Solver license works for you, wherever you need to work! Use it on your office, laptop or home PCs, or to "publish" and run your model in Excel Online, Google Sheets or Power BI. pay for only what you need Every Analytic Solver license gives you access to all features in optimization, simulation, and data mining, with size limits. You pay extra to handle large-scale models and datasets, only in the areas you need. All features in desktop and cloud Analytic Solver You can build models and use the same advanced Solvers for optimization, simulation and data mining in desktop Excel, and via a browser in AnalyticSolver.com. Excel Online and Google Sheets have a simplified UI, but even large-scale models you build in desktop Excel and upload to Excel Online or Google Sheets can be run using your desktop license. See for yourself, learn more Register using the form below, download and run SolverSetup, then visit AnalyticSolver.com and login with the same email and password. 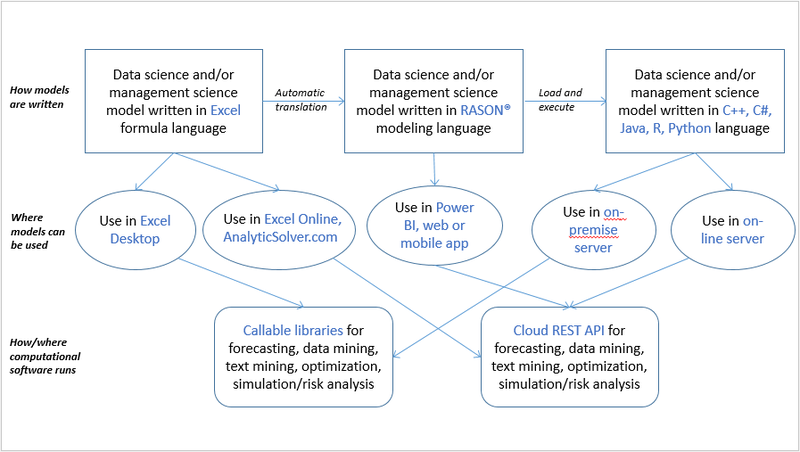 For business analysts, learning to build effective data science (predictive) and management science (prescriptive) models can be a bit intimidating. You're likely comfortable with numbers and Excel formulas, but you might not have used methods from probability, statistics, and linear algebra since college courses long ago. You're in the right place to learn -- we specialize in teaching people like you! Click to view and register for a free webinar: New live webinars every other week. Ask about our “combo offers” for software licenses plus online courses: Get an Analytic Solver Basic software license with your first course! RASON is a mini-language you can use to quickly and easily create and solve analytic models -- optimization, simulation/risk analysis, forecasting, data mining and text mining models, and more. You can use virtually any Excel formula or built-in function in a RASON model -- and they work on cells or single values, as well as vectors and arrays of values at once. RASON is key to deploying your model for use by others who aren't working in Excel. When you use Analytic Solver Create App - Power BI to convert your Excel analytic model into a Power BI "custom visual" (that re-solves when Power BI data changes! ), it's RASON that makes this possible. If you want, you can view and modify your converted model directly in RASON. For developers who want to create server, web or mobile apps, RASON is a natural -- much easier to work with than Excel. RASON stands for Restful Analytic Solver® Object Notation. It's a "lingua franca" easily understood by both business analysts and developers! Compared to using a traditional modeling language, using Excel alone, or writing analytic models in a programming language, it's a huge time-saver. See RASON example models.